Dying Light exceeded most expectations, especially on PC where drama over mistaken DMCA takedown notices quickly transformed into a powerful modding kit which has continued to expand. Players are still hungry for running and jumping away from zombies, it appears, because at long last Dying Light: The Following has been released, in DLC and Enhanced Editions. 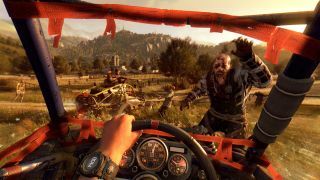 The DLC, which requires a copy of Dying Light to run, is an expansion-sized update, opening up a new region beyond Harran large enough to host dirt buggies and a new storyline. It's being billed as the size of all previous Dying Light maps combined, although how much of that is grassland remains to be seen. Speaking of previous Dying Light maps, the Enhanced Edition is similar to a game-of-the-year edition, incorporating all previous DLC in addition to The Following, plus improvements to the visuals and general tweaking. Both editions and the base game will get 'Legendary Levels' patched in free—a new skill tree opened up upon maxing out one of the default branches, along with new emblems and weapons. Nightmare mode is also in: longer nights, Souls-like loss of XP on death and harder enemies. Sounds grim; have fun!